The International Association for the Study of Pain (IASP) in its classification of Chronic Pain defines cervical spinal pain as "pain perceived anywhere in the posterior region of the cervical spine, from the superior nuchal line to the first thoracic spinous process". The Bone and Joint Decade 2000-2010 Task Force on Neck Pain and Its Associated Disorders describes Neck pain as "pain located in the anatomical region of the neck with or without radiation to the head, trunk, and upper limbs". Pain is classified as chronic when it has a duration of 12 weeks or more. Chronic neck pain often presents as widespread hyperalgesia on palpation and in both passive and active movements in neck and shoulder area. Considerable research has shown that psychosocial factors are an important prognostic indicator of prolonged disability in individuals with neck pain. It is well known that chronic pain is often associated with anatomical, psychological, social, and professional factors. This is consistent with the biopsychosocial model, which considers pain to be a dynamic interaction between biological, psychological, and social factors unique to each individual. 30% of patients with neck pain will develop chronic symptoms, with neck pain of greater than 6 months in duration affecting 14% of all individuals who experience an episode of neck pain. 37% of individuals who experience neck pain will report persistent problems for at least 12 months. Five percent of the adult population with neck pain will be disabled by the pain, representing a serious health concern. Five percent of the adult population with neck pain will be disabled by the pain, representing a serious health concern. Individuals with chronic neck pain are largely middle aged and the majority are female. Clinicians should consider age greater than 40, coexisting low back pain, a long history of neck pain, cycling as a regular activity, loss of strength in the hands, worrisome attitude, poor quality of life, and less vitality as predisposing factors for the development of chronic neck pain. The overall balance of evidence supports a variable view of the clinical course of neck pain. Recovery appears to occur most rapidly in the first 6 to 12 weeks post injury, with considerable slowing after that and little recovery after 12 months. Once considered chronic, the course may be stable or fluctuating, but in most cases can be best classified as recurrent, characterised by periods of relative improvement followed by periods of relative worsening. Pain intensity, level of self-rated disability, pain-related catastrophising, post traumatic stress symptoms (traumatic onset only), and cold hyperalgesia may indicate a potential for chronicity. Chronic conditions often have a lower degree of irritability. Individuals with chronic neck pain often display impaired proprioception. A high-quality review by Stanton et al concluded that these individuals are worse than asymptomatic controls at head-to-neutral repositioning tests. There is a lack of evidence for medical management of chronic neck pain. Trials testing the use of botulinum injections, steroid injections and muscle relaxants have not proven to be efficacious. Clinicians may provide neck, shoulder girdle, and trunk endurance exercise approaches and patient education and counseling strategies that promote an active lifestyle and address cognitive and affective factors. Clinicians should provide cervical or cervicothoracic manipulation or mobilisations combined with shoulder girdle and neck stretching, strengthening, and endurance exercise. Clinicians should provide mechanical intermittent cervical traction, combined with other interventions such as stretching and strengthening exercise plus cervical and thoracic mobilisation/ manipulation. Education is a key component of managing individuals with chronic neck pain and behavioural interventions should play a role in the management of people with chronic whiplash (LOE 5). 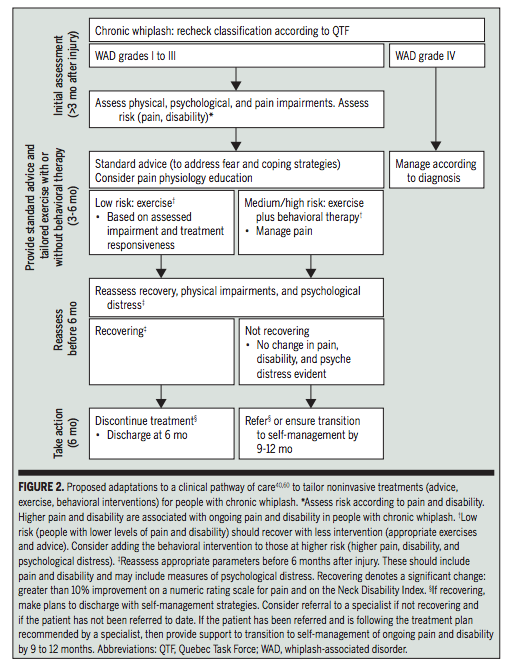 Guidelines recommend that individuals be provided with information about how to cope with pain and disability, particularly as their symptoms transition to the chronic phase. Key concepts to address include reducing catastrophic thought, addressing unhelpful beliefs, addressing fear of movement and providing active coping strategies to assist patients to cope with pain (LOE 5). There is some preliminary evidence that pain neurophysiology education in chromic WAD improves both pain behavior and pain thresholds (LOE 5). Cognitive Behavioural Therapy (CBT) is a method that can help manage problems by changing the way patients would think and behave. It is not designed to remove any problems but help manage them in a positive manner. The CBT approach to LBP can be as effectively applied to neck pain and can be included in your education strategy. If relevant psychosocial factors are identified, the rehabilitation approach may need to be modified. An emphasis on active rehabilitation and positive reinforcement of functional accomplishments is recommended. Graded exercise programs that direct attention towards attaining certain functional goals and away from the symptom of pain have also been recommended. Finally, graduated exposure to specific activities that a patient fears as potentially painful or difficult to perform may be helpful. ↑ 6.0 6.1 6.2 6.3 Rebbeck T. The Role of Exercise and Patient Education in the Noninvasive Management of Whiplash: A Clinical Commentary. Journal of Orthopaedic & Sports Physical Therapy. 2017 Jun 16(0):1-32.